Stephanie and I are celebrating our twenty-fifth anniversary this month, so we decided to do something extra special—we signed up with an outfitter to go on an archery moose hunt. You should see Stephanie all decked out in camo with her bow and knife, and her face painted green. Actually, the outfitter was booked, so we got plane tickets to France instead. This weekend we're near the northern coast in the Normandy Region and right now we're on a train going through a rural area filled with cows and sheep and of course a chapel in every little town. 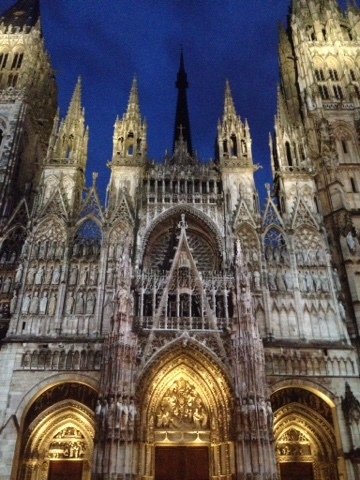 Last night we stayed in the medieval city of Rouen. Growing up in a city where the oldest buildings are barely one hundred years old, it's pretty cool to see structures that have been around hundreds, and even a thousand years or more. The Notre Dame Cathedral in Rouen is one of those. This isn't the one from the Disney show—we'll see that one next week. This is a different one without a famous bell-ringing resident. But even this one is a very impressive structure. The craftsmanship of the artisans and laborers that threw this thing together is awe-inspiring. The thing that struck me most though, was this: you gotta figure that in today's dollars, this edifice must have cost millions. And those millions were spent at a time when there was a lot of suffering in the world. I wonder if any nonbelievers back then—or believers, for that matter—pondered if the money and effort might be better spent on something else. In any case, it's a beautiful building. In the evening, we heard about a light show at the cathedral. I figured at most we'd just see a few lasers painting designs on the walls. Boy, was I ever wrong. They had a fantastic display of light, music, and sound effects that went on for an hour. They projected the images onto the facade and told the history of France with all its wars and one of the most awesome women of all time—Joan of Arc. Or as Bill (or was it Ted) described her: a totally triumphant babe. If we saw nothing else our whole time here, it was worth coming all the way to France just for that! Madame of Arc, by the way, was burned at the stake in that very town, down the street from the cathedral, apparently with the help of some clergy members. I'm sure the original builders of the cathedral never had a computer-synchronized light show in mind when they stacked all those rocks together. Maybe it was worth the effort after all. Do you think Miss of Arc would approve?